We are very pleased to offer you these beautiful needlepoint Christmas stockings designed with the true meaning of Christmas in mind. 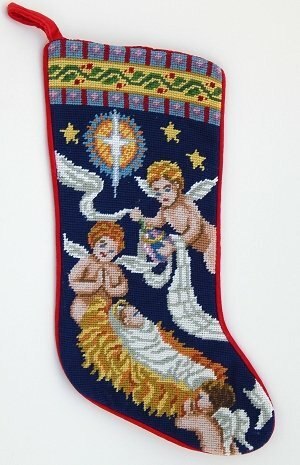 A beautiful needlepoint design by Artist Susan Brack of Baby Jesus in the manger. Angels fly above and around him rejoicing. This stocking is part of a series that Susan did for us around the nativity theme. A beautiful needlepoint design by Artist Susan Brack of the animals at the manger. They gaze upon the star that shines over Bethlehem. 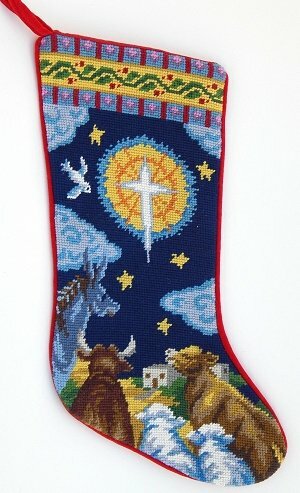 This stocking is part of a series that Susan did for us around the nativity theme.